During an Occupy London protest in May. Demotix/Paul Ottavio. All rights reserved. 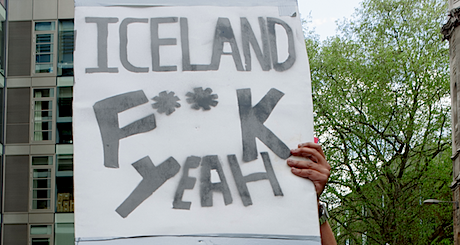 Four years have passed since the financial system crashed in Iceland. The crisis hit Iceland harder than many other countries: the whole banking system defaulted and crashed. Attempts to bail out the banks failed, and because of the size of the banking system in Iceland, the government did not have the option of taking them over - the Icelandic state would have defaulted. These are important achievements. Things that other countries could learn from. But frankly, most of these developments were also controversial in Iceland and overall, they could have been executed more efficiently. For example: the idea that the general public should be actively involved in creating a new constitution is indubitably right. But this could have been better carried out. The selection process didn't have the legitimacy it needed and random selection should have been used as well. The time given to the process was too short. There was not enough debate all over the country and in the media. Of course, in comparison with the constitution being rewritten by a small group of politicians in closed session, as usually happens, the new process was great. But it could have been better. And there are many, many unsolved issues. The financial system has not been restructured but restored. And a system that is restored will yield the same results. The political system, trusted by only ten per cent of the population, has not been fundamentally revised either. Most of the changes were minor and cosmetic. The path towards a real democracy is becoming clearer - and it will be a long one. That was already obvious in 2009: just after the elections for parliament, many sensed that the left-wing government simply didn't have the ideas and institutional models for restructuring our financial and political systems. Political parties didn´t have a plan B - no alternative to western capitalism (and actually TINA - There Is No Alternative - has been one of the Icelandic right's strongest arguments during the last twenty years). As a response, a group of us formed Alda - the Association for Sustainability and Democracy. Our goal was first and foremost to introduce into the public debate ideas and institutional models on how to restructure our economy and the terrain of politics. Alda is only one of many new grassroots organizations in Iceland since the crash which focus on changing the structure of society in some way. Alda has been promoting ways to deepen our democracy - our focus is on institutional models that have been tried and tested. And fortunately there are a lot of great examples out there. When it comes to politics what is clear is that we need a shift to participatory democracy. Participatory budgeting is one way to go: the most famous example being Porto Alegre in Brazil, but participatory budgeting is starting to be used all over the world (New York is one of the latest cities to try the process). In Brazil it has led to greater equality in the distribution of public assets and services, less corruption and a more vibrant civil society - to name but a few positive outcomes. In Iceland, the city of Reykjavík is also experimenting with an online version of participatory budgeting. For now, it concerns only a small portion of the city's budget, but we are hopeful this model will soon spread to other cities and communities. Alda also promotes the idea of randomly selected citizen assemblies. This participatory process has already been tried in various places. One example is the Citizen Assembly in British Columbia, where randomly selected people from the general public were invited to come up with ideas to change the electoral system. Directly involving citizens is the way forward - and research (by Helene Landemore for example) on random selection indicates that cognitive diversity outperforms individual ability or knowledge. The old political parties in Iceland do not have a real democracy, as envisioned by Alda, on their agenda. A few of the numerous new political parties that have been created since 2008 might have adopted some of its aspects - but none has as of yet called for a radical restructuring of our political and economic system. Nevertheless, the ideas are gradually getting out there, into the public debate. And that's the first step, making them familiar - because people will not call for things they don't know about or turn to unfamiliar ideas. And that is our greatest regret - that there was no plan B when the financial crisis hit in 2008.